It was dark. Really dark. The kind of darkness that makes you question your sanity. The only thing louder than my pulse was the slow drip of a faucet that bounced off the concrete walls. Cold metal handcuffs pressed firmly against my wrists. I could move, but only as far as the heavy chain would allow. Only minutes had passed since we were blindfolded. But every second would count. Not every company subjects its crew to extreme escape scenarios, but when you’re a distributed team like EmberTribe, you have to make the most of the (face) time! 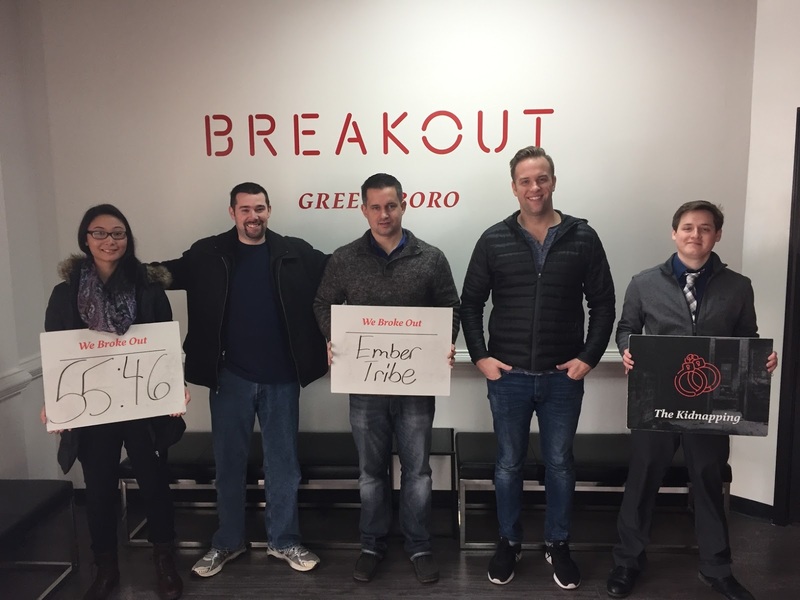 At our most recent meetup, some of our team took on the challenge of escaping from a “Breakout” room. The team building concept is catching on quickly with dozens of franchises sprouting up across the nation. Our experience unfolded at the Greensboro, NC location. The objective is simple: work as a team to escape! Think of it as a life-sized puzzle. Without going into specifics (you’ll have to experience that yourself! ), you have to crack codes, look for clues, and use logic to escape. Each riddle you solve leads one step closer to victory. The catch? You only have 60 minutes to do it. The scenario we chose was called “The Kidnapping”, in which a crazed serial killer (somewhat altruistically) gives you 60 minutes to escape before...well, you know. Here’s the trailer. The Breakout Games company records data from thousands of these escapes and monitors each one through video surveillance. The odds they gave us to escape? A mere 20% success rate. This post isn’t so much about the destination as it was the journey, so I’ll let the cat out of the bag: we made it! Beating the odds confirmed what I already knew: I work with some of the smartest people I’ve ever met. But there’s a lot more that I learned about teamwork and how we’re wired. 1. We all process information differently. Our team is divided evenly between folks who process internally and the loudmouths like me, who are verbal processors. This also correlates somewhat to personality. In the breakout room, some of our quieter folks would wait, listen, think and then nail a solution that seemingly came out of thin air. The learning here is that quiet ≠ disengaged. It’s important to remember this during brainstorming meetings and really any group context. On the other hand, loud ≠ domineering. Verbal processors need the same space to talk through a solution. Empathy and patience are key. 2. Don’t jump to a solution too quickly, collect the facts first. One reason why we were successful in the breakout room is that we leveraged the power of observation. Put another way: we would state the obvious first, then figure out what that meant for next steps. When you jump to a solution too quickly, you work on faulty assumptions. I made this mistake at one point in the breakout room. I found a puzzle piece and started working under the assumption it was meant to fit on the floor. In fact, the piece only made sense when it was held up to the wall. This principle has a direct application to our work as an agency. We let data drive solutions for our clients. When we’re measuring performance for an ad campaign or a landing page, we carefully observe and then think about architecting a solution. Let the facts sink in, challenge your assumptions, then think through a solution. Definitely something I want to continue to build into our culture here at Ember. 3. Efficient teams work together but separately. In the breakout room we all focused on a common goal. When we unlocked a new box we would huddle and observe. But then we would disperse a bit while working on the next obstacle. Some people took notes on a whiteboard, others tinkered with puzzle pieces. Others reviewed past clues. There was an efficient form of communication unfolding in the room where we shared information without hyper-focus on one part of the problem. 4. When something isn’t working, change your perspective. Some challenges can’t be solved until you change your perspective. In the breakout room, different clues are revealed with the lights on and others only when the lights are off. Changing perspectives in a breakout room is easy: just walk to the other side of the room and look at the riddle differently. In the real world, it takes an intentional effort to change perspective. One way that our team and processes can improve is to schedule time for different team members to audit our client’s accounts. We do this already when we hit a roadblock: conversion rate is stalling, ad campaign growing tired, etc. But a big win for us will be to pre-emptively get a fresh “outside” look to make sure we aren’t missing anything in our plan of attack. One of my favorite aspects of the escape room is the countdown. In my post-game analysis I wondered: would have we escaped after 55 minutes if there was no countdown? I’m positive that we still would have escaped, but am certain it would have taken MUCH longer. As I continue to reflect on this experience, I wonder, where should we be self-imposing limits on ourselves as a team to generate more creativity and clever solutions? For example, our client may have a $10M advertising budget, but what could we accomplish with $1k? Having too much of a resource (money or time) can make you lazy and potentially miss a game changing creative solution. Not to get too philosophical, but I think highly effective people learn to dream without limits and act within constraints. 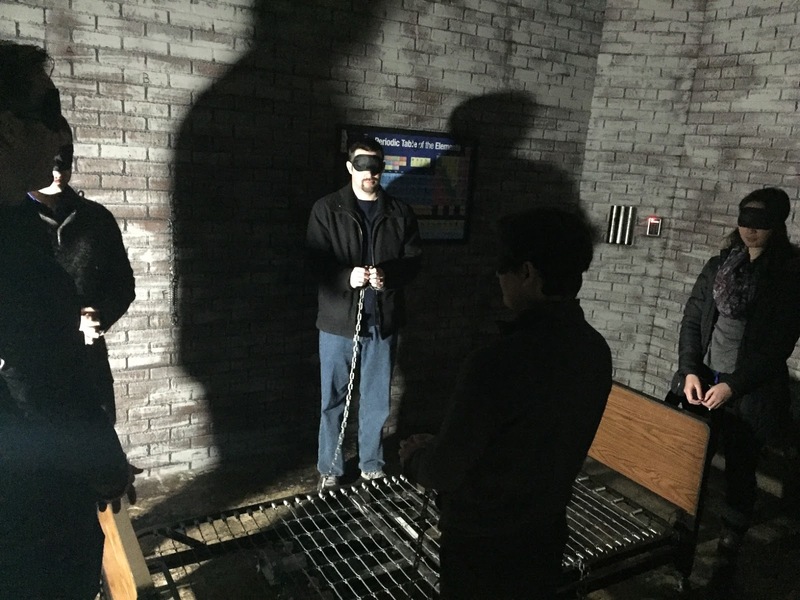 Our team’s experience with the breakout room was really fun and a big win for morale. But I’m even more grateful for the lessons we’re taking with us...beyond the reach of a hypothetical serial killer.